Delivered straight. High beams flash and horns blow in appreciation. I have to say that it’s been 35 years since I first heard that line and it still packs a punch. I was young then, a smarmy teen, and laughed in hysterics when I first heard it… But last night I listened in admiration at the hapless little nothing of an actor forced to utter it (through a megaphone no less). I wondered about the talentless hack who wrote it, and how could he have ever written it, and if he was drunk at the time. Or was he suicidal even, knowing full well that this was his one shot at the big time, any kind of big time, and all he could come up was a line about giant rabbits. Audiences must have laughed themselves silly. No one blamed the actor the actor with the megaphone…who was far enough from the camera to maintain a degree of anonymity, thank god…but only the youngest children in those seats, popcorn all over their laps and ssssshing their giggling older brothers, could not fail to see just how pathetic that sentence was. Now, though, I’m older, lots older. I’m not a rock star, or President, or a world famous writer or world famous anything. I don’t live in one of those big houses on the hill. So I can feel the pain of the actor with that megaphone. He needed the bread. He had bills to pay, mouths to feed (and not rabbit mouths). We all do humiliating things. We have all uttered warnings about metaphorical herds of killer rabbits. Or something to that effect. Just not so incredibly stupid. The wife and I drove across the lonely stretches of the Colorado Plateau this past summer. It’s that highland — dry grasses, sparse, so lonely– that stretches from the northern third of Arizona to the Rockies, and north into Utah and Colorado. There’s nothing there. Cattle, lean and weather beaten. Some small towns, abandoned farms. Nights are vast and black and full of UFO’s and other scary things. Days are haunted by long vanished Indian civilizations. I love it there. This was the setting for the movie. Way out there. At some point on a trek, when we get off the interstate and head off on some state highway or county road and things get really empty out there, I think of Night of the Lepus. To me, the high Arizona desert and those goddamn rabbits are permanently enmeshed. And at some point on the trek, I find myself saying aloud that there’s a herd of giant killer rabbits heading this way. And if you think about it, and I do, there is nothing so profoundly dumb as killer bunnies. Not even DeForrest Kelly can make it believable. And he dealt with Lizard Men, salt creatures, and hortas. Here he just looked sad in that little mustache. I hope Janet Leigh was nice to him. 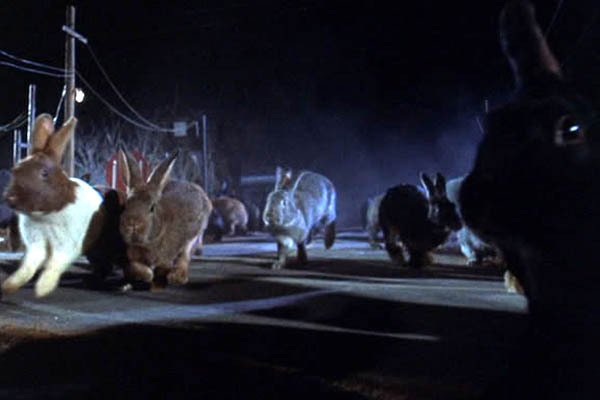 There’s a herd of giant killer rabbits coming this way. This entry was posted in Movies and tagged DeForrest Kelly, Janet Leigh, Night of the Lepus. Bookmark the permalink.